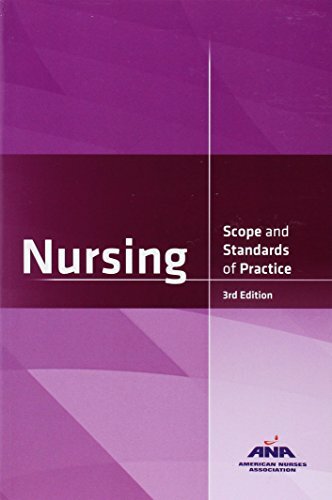 1558106197 -The premier resource for professional nursing practice, Nursing: Scope & Standards of Practice, 3rd Edition, is informed by the advances in health care and professional nursing today. This keystone standard contains 17 national standards of practice and performance that define the who, what, where, when, why and how of nursing practice. The scope and standards of practice inform and guide nursing practice and are often used as a reference for: Quality improvement initiatives Certification and credentialing Position descriptions and performance appraisals Classroom teaching and in-service education programs Boards of nursing members’ orientation programs and regulatory decision-making activities It also outlines key aspects of nursings’ professional role and practice for any level, setting, population focus, or specialty and more! In sum, Nursing Scope and Standards of Practice is a detailed and practical discussion of the competent level of nursing practice and professional performance. It is a must-have for every registered nurse.